Decisions were made during the assembly regarding theological education, an affirmation of continuing the LWF's humanitarian response on behalf of those affected by war in Syria, the inclusion of gender justice in the LWF Constitution, advocacy regarding climate change, the United Nation's Sustainable Development Goals, the commercialization and commodification of God's creation, the right to education, unfair distribution of the world's wealth, and more. 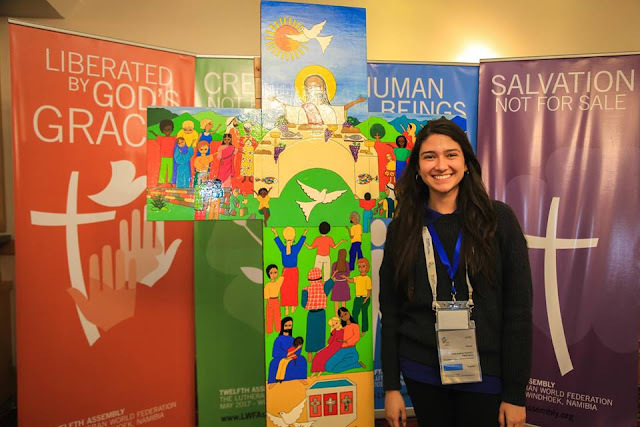 Liria Andrea Suárez Preciado, a young adult of the Evangelical Lutheran Church of Colombia and theology student, was able to attend the assembly and present the book of workshops to strengthen Lutheran identity (blogged about before) of the youth of Colombia. The book was on of two youth projects from the Latin American region chosen to be presented at the assembly. We asked Liria a few questions about her experience at the assembly. Liria at the assembly in Namibia. Photo submitted by Liria Andrea Suárez Preciado. 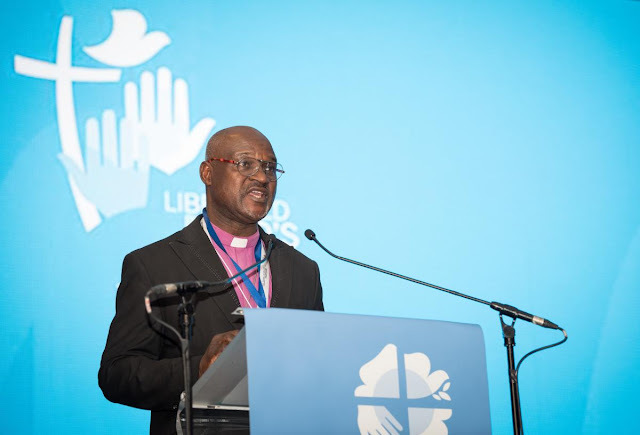 Why did you go to the Lutheran World Federation Assembly in Namibia? How were you able to go? I went to the Assembly through a call for volunteers from the Lutheran World Federation. This call was made by “the youth secretary”, which opened the call for all young people, mainly those who had participated in the 2015 Young Reformers Network in Germany, to apply to be “stewards” in the Assembly. They opened the call from April to May, and those selected to participate were informed in September of last year. As it was a volunteer opportunity we had to send in our resume, our relationship with the Church and the work we do in it, finally selecting the area we most preferred to work at the assembly. What were your responsibilities at the Assembly? As a “Steward” my responsibility was to help as much as possible in anything that concerned the logistics of the Assembly, so we were told to be open to any task that might come up, even if it was different from our own specific jobs. Specifically, I was part of the “devotionals and worship” working group. This group was coordinated by two group leaders and different professionals in liturgy and music, as well as three other “stewards” and two volunteers. Our responsibility was to make sure that everything with respect to the devotionals and worship services went smoothly. We helped the people in their rehearsals (through our assistance and accompaniment), we also did the cleaning, the decorations, the organization of communion stations and chairs, everything that had to do with the Eucharist (wine, wafers or bread, chalices and dishes), cleaning them and attending to anything that came up unexpectedly. Liria at the assembly in Namibia. Photo from the LWF website. What did you learn about the Lutheran world communion during your experience at the assembly? I was specifically moved by all that had to do with the liturgy at the Assembly. I was enriched by the diversity of the ways of expressing the liturgy without leaving aside its order and essence, showing the diversity of cultures that in itself enriches the Church. The different expressions to praise God are also what unite us. They promote unity within the diversity of cultures. 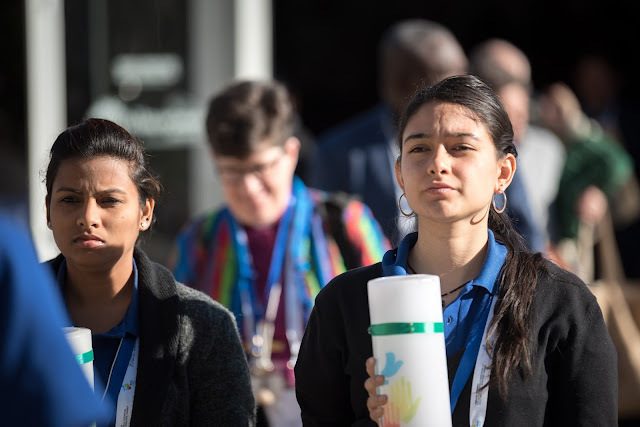 That diversity helps us to know ourselves as churches, to support our calling by the Word of God, and also in our answer to that call we are committed to continue working in accordance with the gospel. How was your Lutheran Identity changed by attending the Assembly? My Lutheran identity is strengthened rather than changed. This experience has reinforced my Lutheran identity as an equal in baptism with the other members of the Lutheran World Federation, showing that we are truly a communion that has Christ as its center, with its immense love and surrender, has given us the gift of being sons and daughters of the Father through the Son; So now as a Lutheran I do not see myself as one more of a historical denomination, but I am part of a family that is strongly committed to the mission of Christ. Nigerian Archbishop Musa Panti Filibus was elected as the LWF President at the assembly. Photo from LWF assembly website.